Nokia is yet to officially release the Nokia 1 but its already on Amazon for $101. The budget smartphone comes running on Android GO out of the box. Android GO is an operating system created by Google based on the 8.0 Oreo, but for budget smartphones. Apart from running on the new OS, it is powered by a 2150mAh which is impressive. Nokia are known globally for having long lasting battery on their device, even their new Android phones doesn’t disappoint. Now lets see what else the Nokia 1 has to offer. From afar you can tell its a Nokia smartphone, probably because of the way the camera is. The camera and LED flash are vertical at the top middle, with th camera on top. Made from both Aluminum and plastic, the Nokia 1 is as beautiful as its older brothers. Nokia didn’t really do much on the Nokia 1 compared to its brothers, although they sport similar overall design. It comes in only black and white, its uncertain if other beautiful colors would be rolled out as well. Its quite bulky, measuring 9mm in thickness, probably because of the 3000mAh battery. The display isn’t that perfect and its definitely not the Nokia smartphone that will launch the bezel-less trend. Now the question is, which Nokia phone will come with the bezel-less trend? The Nokia 4 or the Nokia 8? However, we all knew it won’t happen with the Nokia 1, c’mon its a budget smartphone. The 4.5-inch portable FWVGA screen has lots of bezels to say the least. The IPS LCD capacitive touchscreen boasts of 480 x 854 pixels in resolution and 218 pixel per inch density. Disappointing? Well i know, the screen is nothing to write home about. With 61.7 screen to body ratio, i feel like its the year 2010 all over again. 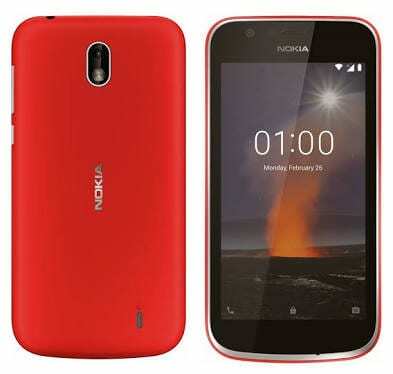 The Nokia 1 houses the Snapdragon 212 chip from Qualcomm with Quad-Core processor. The processor reaches a speed peak of 1.3GHz, so there would be lagging and a few downtime. For graphics, the Adreno 304 graphics processor from Qualcomm is in charge as well. The CPU architecture is 34-bit while the process technology is 28nm, achieving a somewhat smooth ride. There’s just 1GB of RAM here reaching a memory speed of 533MHz, and there’s no surprises whatsoever. Remember Google announced that only budget smartphones with 512MB to 1GB RAM will run on Android GO operating system. It has the standard 8GB of internal storage, which is upgradeable to 32GB using the microSD slot. The rear camera isn’t that brilliant, being able to capture just 2K resolution images. Photographs taken with the Nokia 1 can’t go more than 2592 x 1944 pixels in dimension, which is disappointing. Furthermore, it comes with a LED flash and quality features like autofocus, continuous shooting, digital zoom, exposure compensation, ISO settings and others. While at the front, there’s a simple 2MP selfie camera with no flash in sight. Nokia 1 is powered by a 2150mAh removable Li-Ion battery with no fast battery charging feature. It should take about 2.4 hours to fully charge the device from 0% to 100%. What is Nokia 1 Price and Availability Status? You can click on the links below to view the latest Nokia 1 price & availability.